Just Jingle: Thank You Beary Much! It's Wednesday and that means it's time for another AWESOME Simon Says Stamp Wednesday Challenge! This week, our theme is Create with Critters! We want to see critters front and center on your project this week! The Design Team is featuring Lawn Fawn this week. You know how AWESOME Lawn Fawn is when it comes to critter images! You don't have to use them to play along, but if you have some, we'd love to see how you rock them! I pulled out the adorable Party Animals Stamp Set again. It is just TOO cute! I love it! I colored him and then die cut with the Scripty Thanks die to create a layered inset look. A touch of patterned paper and a few sequins finish off the design. Now it's your turn! Create something adorable inspired by the Create with Critters theme for your chance to win a $50 Gift Voucher to the Simon Says Stamp store! And if you happen to have your OWN critter at home, don't forget to post a photo! 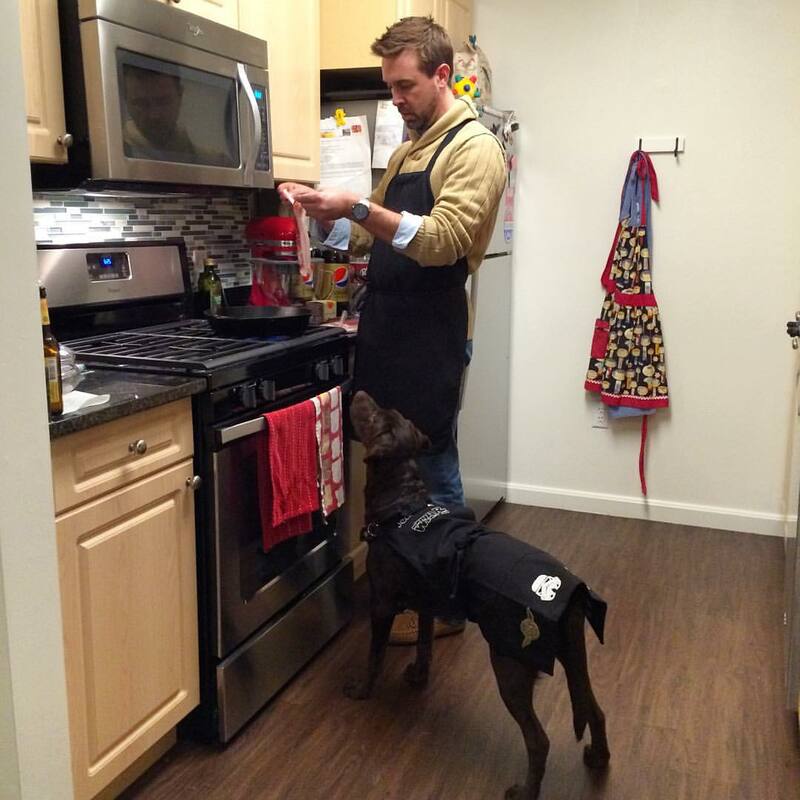 We love seeing your critters! Here is a recent photo of my little critter, Morgan, cooking with her Daddy. She likes to help. And, obviously, needed to wear a Star Wars apron. Obviously. Your card and real life critter are too cute! 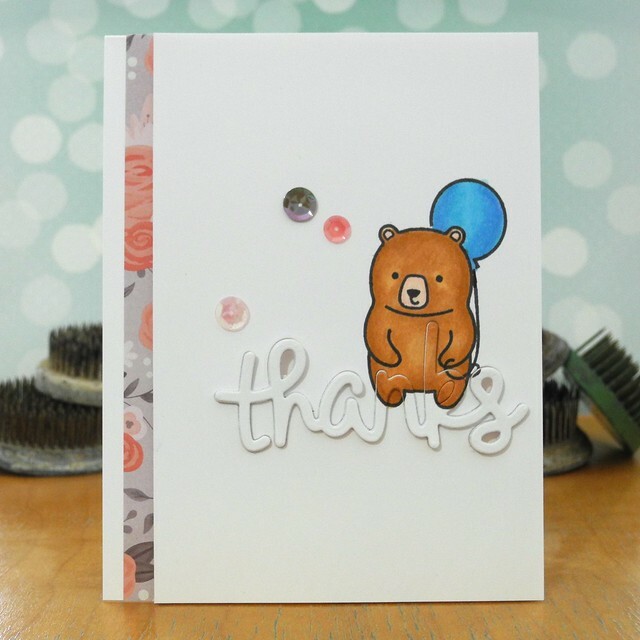 Super cute card Jennifer :-) the little bear is adorable and I love how you used the thanks die cut. I used to collect Teddies, so this warms my heart, Jennifer! And love Morgan's apron! She is very well-behaved.....our Brandy used to put his front paws up on the counter when he "helped"! An adorable card Jennifer, I love the cute Teddy where he had the sentiment added. Morgan helping his 'Daddy' is adorable - my cat is useless - doesn't do anything but eat!! How creative and cute is this, Jen! Love how you tucked in the sentiment with the bear! Your Morgan is so sweet and I so glad that the Star War Apron shows her fan pride! I think I just got this set...what a cute card! Adorable card Jennifer!! Such a great design!! Oh this is so cute, love how you've made the sentiment. 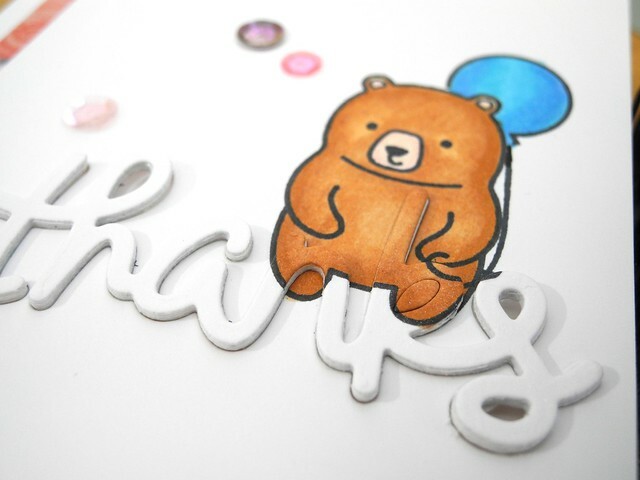 Love how you have overlapped the sentiment diecut on the bear and added dimension to the inlay. Just awesome! adorable card and you babies look adorable in the kitchen!